English actor best known for appearing in movies such as The Patriot, Harry Potter, Armageddon, Event Horizon, Blackhawk Down and Soldier. On TV he has appeared in Brotherhood and Awake. Jason was quoted in the Mirror Newspaper (around 2001) as saying "I'm 5ft 10ins, so I'm hardly small", although he has also claimed to be 5ft 11, a height that is listed on his Spotlight Casting resume: "Height: 5'11" (180cm), Weight: 12st. (76kg)"
About all I liked watching him in 'A Cure For Wellness' yesterday was his convincing Swedish/Germanic accent! Oh, his acting was fantastic as always, but the character he played was mega-mean in the extreme! This excellent actor gets 5ft10.75. I know the name, and I have seen Jason in 'Armageddon', 'Event Horizon' and more. Now I am going to watch him in the delightfully entitled 2017 film 'A Cure for Wellness', so I'll be able to decide for myself whether I think he's 5ft10 or 11! The film, as the title might suggest, is 18-rated! Am I a glutton for punishment, or what? Felton is leaning a lot more in the picture you posted, did you notice that? Rob 5'11.5" or at least 5'11.25" is possible for him? I think an honest 5ft 11, at times he has passed for 11.25, but then on Discovery, I don't think he looked more than just 5ft 11. Rob must be kidding. Jason Issacs certainly look over 5'11 with Felton and the Phelps Twins. I did see him as high as 5'11 1/2 and 5'11 1/4 low. "Certainly isaacs is well over 5ft 10"
I'm not sure why that would be kidding, well over implies more than half inch. He actually looked a strong 5' 11" in person. A few double shots of him and Felton from conventions Click Here, Click Here, Click Here. Certainly isaacs is well over 5ft 10. He look 5'11 1/2 with the 6'2 1/2 phelps brothers. 182cm in the morning . Seeing some old snaps from the premiership of black hawk down he is 180,what I think is Orlando bloom needs a downgrade to 177cm based on some of the pics. Rob, maybe somewhere between those two claims? I say 5'10, I considering him having that height listed in that movie with jackie chan, Rob, what would you say his head length is? Editor Rob: headman, definitely over 9 inches, but not more than 9.5, close to that mark though. Maybe he was 5'10.5 so he putting down 5'10 at a time and decided to round up 5'11? Towers over Radcliffe, 4 inches taller than 5ft 7-8 Rupert Grint, and isn't much shorter than Robert Pattinson. Definitely more 5ft 11 than 10. Rob, why is he listed 5ft11 if he claimed 5ft10? Editor Rob: he's been quoted saying both...the 5ft 10 might have been a misquote, I don't think he looks that short. Are you sure there were only 0,3-4" between you? 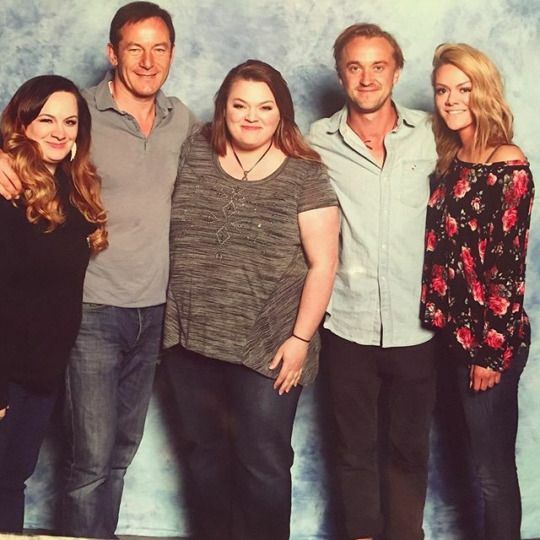 If Tom Felton is 5'8.5,'' then I can see a 5'11'' max for Jason Isaacs. But then he does look about an inch taller than Orlando Bloom, and the same height, if not a teensy bit taller than Viggo Mortensen. There's also every chance that Hartnett is a 190 cm guy as well. 180 cm is fine for Jason imo. Maybe 5'10.75 could be a good listing, but 5'10.5 feels a little low - unless Bloom is 5'9.5 and Mortensen is 5'10.25. In the Jackie Chan movie The Tuxedo, Isaacs's character is credited with a height of 5'10". Maybe he is more of 5'10.5" than a full 5'11". Yeah, I'd be happy with 5'10.5" for him, myself. I think you should put 5'10.5 . I too thought he was 5'11 but he seems to be a weak 5'11 at best like 5'10.7. If he claimed 5'10 and 5'11 common sense is he's in between. Or 5'11 was a shoe height. First pic he look close to 6'0. The other sacha baron Cohen pic is bad. Weird angle.even so Isaacs looks 5'10. The one next to 5'8.5 guy he looks 5'10.5. I think he's a 5'10.5 guy. He's not a mm over 5'10. He looks 6'0 in Harry Potter but 5'9.5 in Black Hawk Down cause Hartnett is huge. He must be 5'10. Rob time to downgrade. His quote from 2001 may actually be more near the truth. Usually, I'd compromise and say it'd be enough to take off half-an-inch. But, in this case, I think we should take him at his original claim. There doesn't look to be any way he's above 5'10". I met Jason about 7 years ago in Providence RI while he was filming brotherhood. I'm 5'10" and he was at least 2in short than me. Sorry but camera angles do great work. Having said that he was wicked nice and she'd me a good spot to buy a house. He mostly strikes me as a tiny bit under 5'11, so 5'10.5 or perhaps 5'10.75 is a good shout? Watching Awake earlier and i thought he looked like a 5'10 dude. 5'10.5" may be a good shout for this guy. Like others have said, he could round up or down at times. There are a few more photos around that time showing Isaacs taller, but it's because of footwear difference (he and Boots and Viggo in normal dress shoes). I think this listing is about right. Maybe a quarter-inch in either direction. Could he be 5'10 1/2 and rounds down or up at times?? check out the movie 'Good' from 2008. he's a bit shorter than 5'11 Viggo Mortensen, I'd agree with your 5'10.5 estimate. 5'10.5- 5'10.75 perhaps closer. He looked reasonably tall as Lucius Malfoy. Rob or anyone else who can come up with a good guess, why on earth would he say 5'10?? what actor downgrades his height. He looks 5'11 and even 6'0 next to some actors who claim 6'1 or 6'2. like in the patriot he looks 6'0ish next to 6'1 Tom Wilkinson but body shots of Issac look 5'10-5'11. Could he be 5'10 1/2 and rounds down or up at times?? [Editor Rob: he has been quoted saying 5ft 10 and 11. There is a chance the journalist wrote down 5ft 10 instead of 11, sometimes that happens. Hugh might be right this time. You people are blind or what? He looks clearly taller than Mortensen in every photo! 5'11 for him and 5'10.5 for Mortensen is the sad reality. Has a wonderful talent for character acting and 5'10 min 5'11 max looks right. he's in a new movie "Good" with Viggo Mortensen, and in the released stills Isaacs is just a bit shorter, although Viggo could be wearing heels. Viggo is usually pegged at 5'11" -- maybe Isaacs is 10.75" and Mortensen 11.25" ? Looked between 5'10"-5'11" next to Jonathan ross at that comedy awards show tonight (13th Dec). Quoted in the Mirror, 2001 as saying "I'm 5ft 10ins, so I'm hardly small". Him saying 5ft 10 and Radcliffe saying "5ft 5.5", hmm. dmeyer-Interesting, without doubt Isaac looks a solid 5'11"! Have here another Sly case? Does Bruce Willis care about his height in order tha the producers might think of him when a new though guy role is available? This sounds pretty accurate. At the empire awards he towered over Daniel Radcliffe, who was most likely wearing some trusty elevator shoes. It leads me to believe that Radcliffe may be even shorter than 5'4". His agency CV lists him at 180cm, 76kg.